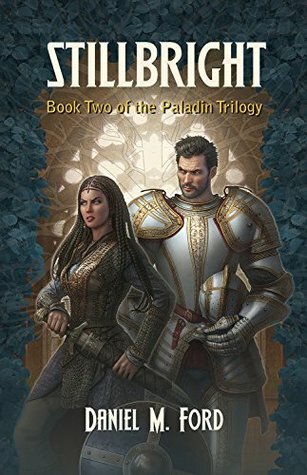 Sequel to Ordination I reviewed a week ago, Stillbright picks up exactly where the first book left off: Londray, the home of Baron Delondeur. By the end of the first book, Allystaire was invited for a talk with the Baron which ended with him being pulled into the catacombs. It’s exactly there where the second book starts with the sorcerer and his apprentice from the first book’s prologue “examining” him. Of course, IdgenMarte and Torvul are not willing to leave him to his fate and hastily create a plan that would free him and even do some side damage to the Baron. Yet Allystaire manages to overpower the sorcerer to the shock of everyone and get on his way out when he’s found. That’s, by far, not the end of the trouble, something they all know. Along with them, the nameless student and a to-be-sacrificed woman escape the place knowing that the baron will most likely give them hell sooner or later – for this and all the insults suffered from Allystaire in the past. Their hasty return to Thornhurst has them face unexpected challenges in form of beast-men and the student’s power. They make it eventually, with some of the beast-men freed of their curse – only to face new challenges. Servants of Braech, the sea-god, use their magic to deprive Thornhurst of rain and so starve the citizens by drying the soil. When that is finally done, servants of Fortune arrive to try striking a bargain not too good for them – and beset by ambition among their own that threatens the diplomatic attempt more than Allystaire’s straightforwardness, which is something. Realizing that their enemies will sooner or later (and most likely sooner) came crashing down upon them, Allystaire does his best to prepare the village for the coming threat. When they come, it’ll take everything they have and even more to defend the village and what the people there stand for – which is as much as I can say without spoilers. It still has much of the first book’s appeal: Torvul, Idgen Marte and Allystaire with their differences and teases. Joined by the sorcerer’s apprentice (later named Gideon), it adds several both funny and memorable lines. There’s also reveal of why Allystaire seems to keep distance from women – a hint of his tragic past. It seems that the third book will flow straight from the second one as well and the end shows that there might be quite some surprise as there are visitors to Thornhurst, and quite unexpected ones.